Woke up this morning to find that my Gold barb males have donned their mating colors. I guess they like their new 120 gallon home. Wow, that's a beautiful looking fish , I want one, do they all look that color, could you take a picture of a female? And do you know how much they cost, they look really cool!! 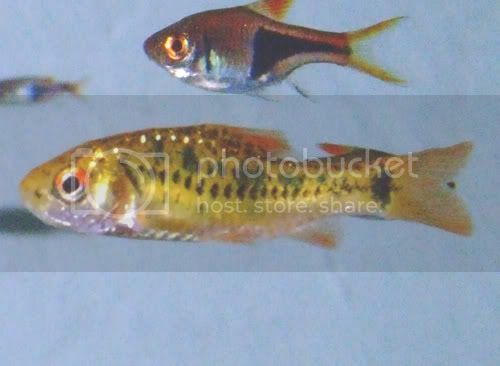 Gold barbs are between $2 and $3 per fish depending on where you get them. I find that they can be a bit difficult to track down sometimes. The only place that has them around me happens to be Petco which isn't my first choice of a place to get fish. I kind of get backed into the corner though when I want more barbs. Oh sweet, the female looks cool and colorful too, but I prefer the males, they look better, haha. Not only are they nicely colored they are very active as well. Mine don't show that much color tho. They are a lighter gold with red fins. The color on your little guy is amazing. The males are more colorful but they will show off their best colors and behaviors if they have females to impress. 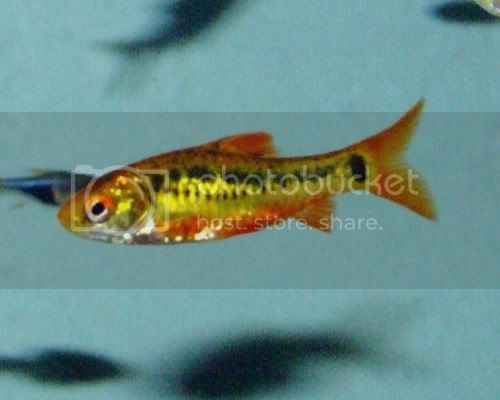 Gold barbs are really great fish and in a tank that large you can have a really big school of them. I love how they school tightly together. I have 8 in there that I transferred from my 55 gallon. My males were not that colorful in the 55 gallon, but they seem to like their new living quarters. I purchased 8 more today that will be joining the original 8 in the 120 gallon soon. Aww man, ANgela I envy you. I can only afford a 10 gallon, haha, but I guess thats because I'm 15. Walmart carries them a lot, and usually very cheap $1-$2. Its weird as I seldom see them at major petstore chains.